Parish Church. Begun in 1774 by Joseph Devall. East tower added in 1828 by Joseph Gwilt. Body rebuilt after WWII bomb damage in 1960 by N.F. Cachemaille-Day (1896-1976). MATERIALS: Stuccoed tower, stock brick body (this replacing the bombed church, which was also of stock brick), windows in concrete frames. PLAN: Tower at east end, then aisled body behind, with Lady Chapel to west end and entrance to south west. EXTERIOR: Tower to east end has banded rustication to all levels except top stage. It rises in three stages, flanked by one storey wings in line with aisles. The base of the square tower has a tall blind opening with large voussoirs, then is a stage with corner pilasters and a central blind oculus with voussoirs to each face, that to east has a clock. The top stage is open and has pedimented orders with Ionic half columns to east and west, and Doric pilasters to north and south; a squat central pinnacle to the top. Behind the tower is the flat-roofed body of the church, which was rebuilt in 1960. This has a square windows at clerestory level, and rectangular windows in the lower aisles. At the west end is a Lady Chapel and the present entrance, reached by steps within brick walls. The west front has five rounded arched openings with fanlights, that to south end forming the entrance doors. INTERIOR: Entrance from west into lobby, screened from west chapel by glazed screen, similarly divided from the body of the church. This chapel is lit by the round headed windows at the west wall, and a pair of figurative coloured glass windows in north wall where there is a small altar. The church has an impressive basilican interior, with tall piers of square plan, straight lintels, and square clerestory windows to north, south and west. A square vent above each pier. The tall ceiling has exposed concrete beamed roof structure with seven beams and joists running east-west. The east apse is gilded, as are the shallow flat capitals of the piers. Altar rail with widely spaced vase balusters, some late-C20 replica. High altar and rood by Martin Travers, 1921. Painted reredos to north altar also early-C20, and brought from Lambeth Palace. Chamber organ c.1800 brought from elsewhere. Pews are C19 from another church. Font at west end has a flat concrete canopy with dove in sunburst detail underneath and a concrete font. Heraldic glass by firm of Goddard and Gibbs. Basement below tower has evidence of C18 brickwork and relieving arches; otherwise with mid-C20 concrete roof structure. HISTORY: Begun in c.1774 as a proprietary chapel by Joseph Devall for his tenants. It was contemporary with the adjacent terrace (Nos. 37-60 odd), which is separately listed. The chapel was bought by Rev. George Richards, appointed vicar of St. Martin in the Fields in 1824, and it 1827 he sold the building. 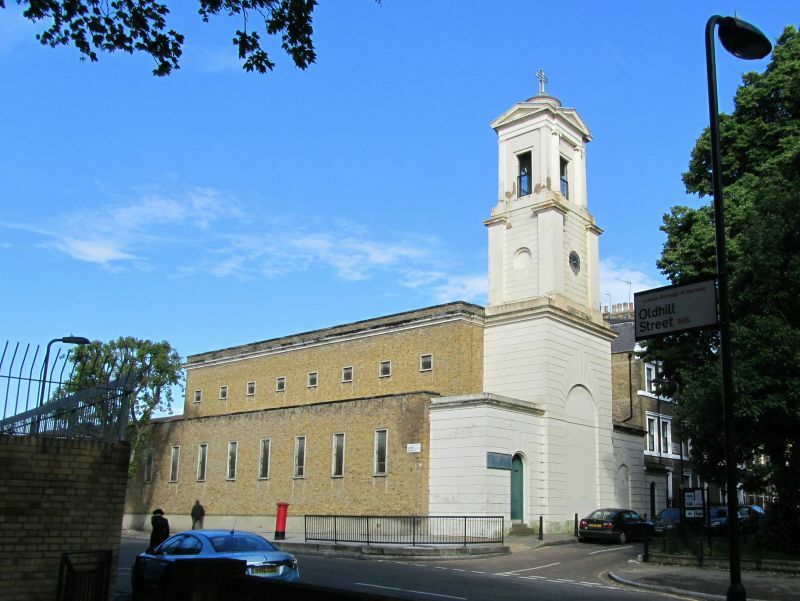 Soon after, the chapel was enlarged and the east tower was added by Joseph Gwilt, being consecrated as a chapel of ease for the parish of Hackney, and dedicated to St. Thomas in October 1827. A faculty was given for reconstruction in 1873, when William Burges removed the galleries, reduced the two rows of windows to one, and built a new wooden roof. At this time, a choir was formed and the church was painted and decorated, including the addition of much stained glass. The chancel was reconfigured in the 'time-honoured arrangement existing at St. Clement at Rome, adapting it to our own ritual' and recognising the church's Anglo-Catholic tradition. The church was severely damaged by bombs in WWII, destroying the interior but fortunately missing the early-C19 tower. Rebuilding was undertaken by N.F. Cachemaille-Day (1896-1976), a church architect of considerable acclaim, who after the war served as Architect-Surveyor to the Archdeaconry of Hackney, an area of London where there had been considerable bombing. Glass was added in this period by the firm Goddard and Gibbs. SUMMARY OF IMPORTANCE: Of special interest as a part surviving late-C18 chapel with prominent early-C19 stuccoed tower, and a significant post-war rebuilding by the eminent C20 church architect N.F. Cachemaille-Day, providing an austere and elegant basilican interior with post-war and earlier brought-in fittings. St. Thomas the Apostle, Clapton Common. Buildings of England London 4: North. 1998. Photographs in National Monuments Record of war damaged church, taken 1945, as well as 1865-6 and c1910 interiors.